Another fun little test to take and explore about yourself! VBG! 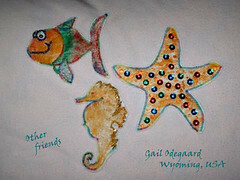 Anddddd, these are some friendly critters that Gail created for the quilt as well! What a neat technique!! I need to remember to ask her HOW she did it!!! Keep forgetting, dang it!! I know they were done on fabric softner sheets and painted....but thats it.... Maybe some solvy?? Not sure!!! OHHHHH GAIIIILLLL!!!!! LOL!!! A brief note on my friend that was the instigator behind this charity project... she is up and about, doing well.... and appears to have no long lasting repercussions from her injury. Accepting the HUGE cute on her head. PHEW!!! Thank you to EVERYONE who kept her in their thoughts and prayers! She is well! :_)) I am ONE relieved friend! This block was a TOTAL surprise!!! It came in from Janee in my local cq group! Isn't that octopus great??? Thank you again, Janee!!! 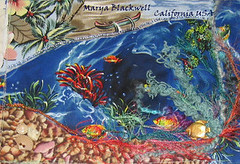 This Marya's first block..... another beauty! This project is really coming out super!!! This gem is from Marya!! Isn't it neat?? 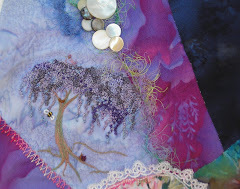 She did a super job creating this lovely piece!! I'm a little behind in getting more UTS quiltlets posted....so here we go! This is Gails 2nd block! Just have to LOVE that dolphin!! Here are the rules which you must abide by if you are tagged.1. Link to your tagger and post these rules.2. Share 7 facts about yourself: some random, some weird.3. Tag 7 people at the end of your post and list their names (linking to them).4. Let them know they’ve been tagged by leaving a comment at their blogs. 1. I LOVE my canine furkids!!! My big Rottie girl being my fav.... just a big teddy bear. 2. I adore riding horses and yearn for the "high trails"! 3. I'm a wanna be green thumb! 4. This isn't an unknown but, .... I love cq, beading and collecting artifacts for the process! 7. I'm deathly allergic to beets. This is the second block in the Sampler rr bunch. 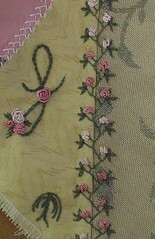 I did a feather stitch with beads coming off at an angle, then added a little bunch of fargo roses in the top corner! 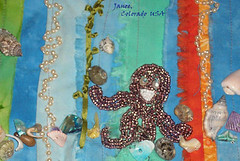 This is work I did for a Sampler rr I am participating in with CQI. I did the double feather stitch with detached chain stitches, added beads, then did a fargo rose vine with a single feather stitch. I prolly shouldn't have crowded this vine in there, but room was limited on this block. Hopefully it will all come out ok. 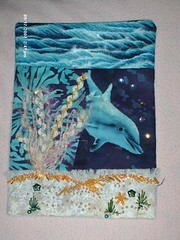 This is work I did on a block for my local stitch group. I did a double feather stitch, then added detached chain stitch "leaves" and cast on flower buds. I also did the initial and added some bullion roses. Of course, I had to add my siggie! 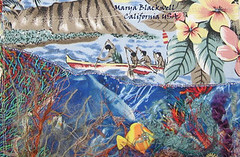 Yet another contribution by Susan Morehouse! 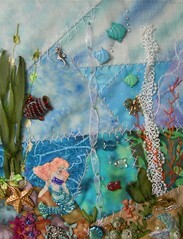 She employed som neat techniques in this with tracing and coloring "Ariel" and has some nead starfish and other fishy charms! The blocks are continuing to float in and are looking great! This is one made by Susan Nixon! 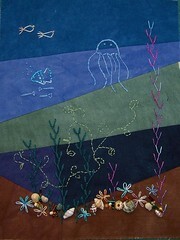 I'm LOVING the stitching for the water current and the octopus and.... VBG!